Lego (or LEGO if you’re adamant about trademarks) has just dipped another toe into electronic gaming with their clever “Life Of George” iOS title. 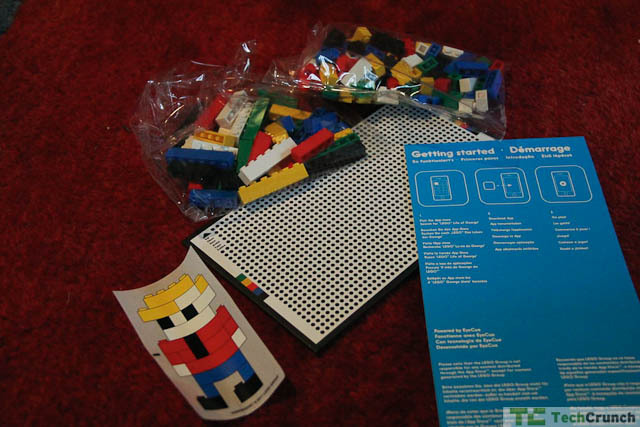 The game uses 144 pieces and a piece of cardboard covered in a dotted pattern. The game is simple: George shows you a picture from his travels and asks you to recreate it using Legos. You have to dig around in your box of pieces to recreate the image and then take a picture of it on the Playmat. Using a brick recognition system from Eye-Cue, the game awards you points for speed and accuracy. The game is oddly addicting and great for kids. The pieces are bit small so it’s aimed at ages 12 and up but it’s also a great way to build teamwork with one player – maybe a parent – calling out the pieces and the other player putting the object together. The game marks Lego’s further attempts at capitalizing on its strong lead in children’s toys into new markets. The impetus for Life Of George is based on the success of the Lego series of video games (Lego Harry Potter, Lego Indiana Jones, Lego My Dinner With Andre) as well as its quiet but apparently popular Lego Universe, a brick-based MMO. By adding a casual game like Life of George, with it’s candy-coated graphics and clever gameplay, you grab the kids who may not want to bring their entire Lego collection to Grandma’s but still want to play with their blocks. As a parent, I find that the game is also helpful in teaching counting and hand-eye coordination as you need to find blocks as quickly as possible and then smoosh them together. Naysayers will note that George does not offer much in the way of imaginative play and I’d agree. But, as we all know, making the thing on the Lego box is often far more exciting than making another “car” using the big green board and a bunch of bricks. There’s a reason behemoths like the 1200-piece Millennium Falcon exists: people love to build things with Lego, but they don’t always want to be structural engineers. To be clear, Life Of George is a casual game in the vein of Cut The Rope or Angry Birds. You play it for a while, maybe forget about it, maybe dump all of the pieces into the main Lego box down the line. However, at $29 plus a free iOS download (a price I suspect will go down over time) it’s a fun way to interact with your Lego using electronics. Herr George has a Facebook page and his game is available on October 1st.